WESTMONT, Ill., Jan. 15, 2019 (SEND2PRESS NEWSWIRE) — Pet health products company, Pet King Brands. 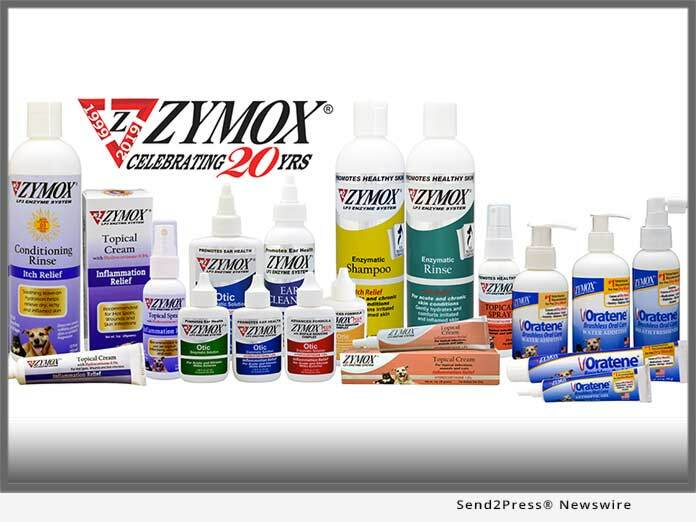 Inc. – the maker of veterinarian-recommended brands ZYMOX® Dermatology and Oratene® Brushless Oral Care – celebrates 20 years of helping pets find relief from problematic ear, skin and mouth conditions. Pet King Brands began with three products and now provides a full spectrum of topical dermatological products for problematic ears and skin – available with or without added hydrocortisone – as well as a full line of oral care products that don’t require brushing to be effective. Since first being introduced through veterinarian clinics nationwide, Pet King Brands has distributed over 1 million bottles of its flagship product ZYMOX® Otic Ear Solution and continues to expand its pet health products line. In addition to veterinarian clinics across the country, Pet King Brands’ ZYMOX® and Oratene® products are available in pet specialty stores and through online retailers. Pet King Brands is led by President and Founder, Pamela Bosco, who first introduced ZYMOX to the veterinary world in 1998. Based on years of research, she knew she had a product that was going to change the way people managed pet ear infections. Pet King Brands’ patented LP3 Enzyme System is used in the most complete and complex enzymatic dermatology and oral care products available on the market for both small and large animals. Its ZYMOX Dermatology products remain a stark contrast to other products on the market, offering effective solutions that are easy to use, free of harsh chemicals and antibiotics, and made in the United States. In addition to its skin topicals, Pet King Brands’ product family includes ear care products, brushless oral care products, shampoos and conditioning rinses. The ZYMOX and Oratene lines represent true advances in the field of veterinary healthcare. Bosco owes her discovery to her brother, Michael Pellico, the bioscientist credited with adapting his enzyme technology in Biotene® – the #1 dentist-recommended product for people suffering from Dry Mouth and owned by GlaxoSmithKline – and making it safe for use in animals. Pet King Brands’ unwavering commitment to the well-being of animals is the reason they take such great pride in delivering high-quality products that are safe as well as effective. ZYMOX and Oratene are available through veterinarians and select retailers. "Twenty years ago, the issues of drug-resistant health conditions in people and animals were just starting to be talked about," said Pamela K. Bosco, President and founder of Pet King Brands.